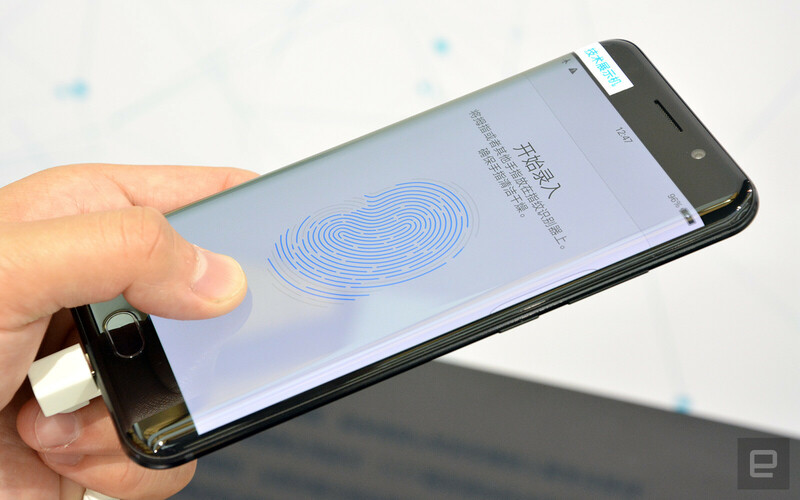 We were wrong – Chinese phone manufacturer Vivo won't, in fact, be the first to put out a device with an in-screen fingerprint scanner, though it most certainly is the first to openly display a prototype. At this year's MWC Shanghai, which taking place right now, the company showed off the first implementation of Qualcomm's just-announced in-screen ultrasonic scanner technology. Vivo demonstrated the new tech with a couple of prototypes, one based on the current Xplay6 (seen above) with the scanner embedded under the screen, and another with it behind a metal-backed phone's shell. Engadget got to play with the prototypes, and according to their report the tech works pretty well, though with some significant speed problems. But while Vivo is the first to put out a functional prototype, there's no guarantee we'll be seeing a phone using the technology any time soon: Qualcomm's announcement clearly states that the technology to embed a fingerprint scanner into displays will only start being sent out to manufacturers for evaluation in Q4 of this year. So this would give plenty of time to competitors such as, say, Apple, to release their own devices on the market first (if they work out the kinks, that is). It's Apple, of course they will! Won't be surprise if they make the entire display a fingerprint sensor. Well, u cant put it past apple, can you? By the time the android world will be getting a hang of this by next year (9 months time earliest), apple would be onto the next big thing already. Exciting times ahead for apple. Really haven't you read the news . Apples patents for fingerprint scanner on power button .Well Mr fanboy If iphone 8 will come with a fps on power button then you will need a mask to hide your face and everyone knows apple has lost its crown for being the most innovative company and this year it will not innovate but it will follow the bezeless trend set by a Chinese company . "and everyone knows apple has lost its crown for being the most innovative company and this year it will not innovate but it will follow the bezeless trend set by a Chinese company ." I thought you were "antifanboyism"? Yes I am .But apple fanboys are always living in their dream world .They have only one thing to say Iphones are great and rest of the world is bulls**t .Apple innovate rest of the world follows or borrows apples tech like beggars .And seriously I am watching Bankz for weeks he is fighting with other phonearena users like school kids fighting for nonsense. Lmfao. yeah... android phones are behind apple phones when it comes to new tech, and not the other way around... thanks for the iris scanners, wireless charging, and hi res amoled screens, apple! It'll be about time, after pulling up the rear the past several years. It isn't going to happen, if it was going into the iPhone, the scanner tech or some other component would already have been leaked. They can't use the QC version because they are having a nice lawsuit issue with them. Fanboys have been claiming that Apple will release a "completely" revolutionary phone for 5 years now, nothing is going to happen once again. Everything should be decent but the software. The OnePlus 5 just beat the iPhone 7 Plus even with launching games. Even the xz premium beat it.